This metal-clad equipment incorporates the levels of quality and precision to be utilized to provide medium voltage power distribution for the second largest telecommunications facility in the world, which supports worldwide voice and data communications traffic. The electro-mechanical overcurrent and directional overcurrent relays were utilized to match the existing 1960’s era devices that were already in service in an adjacent switchboard, partially manufactured by W.A. Benjamin Electric Co. 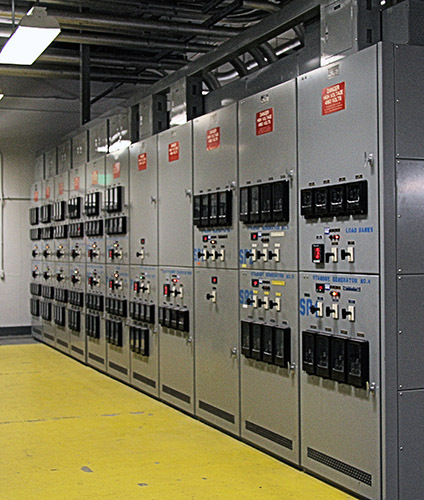 The existing and new switchboard controls were retrofitted with solid-state control relays that were developed for the application of medium voltage breaker control interfaces with distributed PLCs. The load acquisition controls for the twenty-three medium voltage transfer breaker pairs utilize our proprietary “Look Ahead” technology. This programming method uses static or dynamic data exchanges to determine whether the generation capacity is able to support the addition of another load.